YANGON, Myanmar (CNN) -- A verdict is expected Friday morning in the subversion trial of Myanmar opposition leader Aung San Suu Kyi, court officials said. 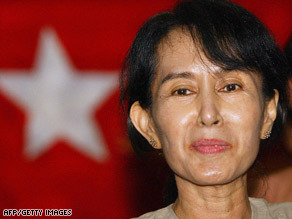 Myanmar opposition leader Aung San Suu Kyi has been held in confinement for 13 of the past 19 years. All lawyers involved in the case finished closing arguments this week. Suu Kyi, 64, and two of her housekeepers are being tried on charges stemming from a May 3 incident in which American John William Yettaw allegedly swam across a lake to her home and stayed for two days. The government said Yettaw's presence in the closely guarded home violated Suu Kyi's house arrest. The country's regime rarely allows her visitors, and foreigners are not allowed overnight stays in local households without government permission. Suu Kyi said she doesn't know Yettaw, didn't know of his plans and denies any wrongdoing. She is charged with subversion. If convicted, Suu Kyi could face up to five years in prison. Suu Kyi has asked her attorneys to find books for her, as she will have nothing to do but read if convicted, said Nyan Win, her attorney and spokesman for the National League for Democracy. Over 100 books have been given to her in languages including French and Burmese, along with several dictionaries and novels, Win said. She has also requested different kinds of medicine, he said. Two defense witnesses were allowed to testify for Suu Kyi during the trial. By comparison, the prosecution team was allowed to call more than a dozen witnesses. If convicted, Suu Kyi, her housekeepers, and Yettaw have 60 days in which to appeal. Yettaw, a 53-year-old former military serviceman from Falcon, Missouri, testified repeatedly that God had sent him to Myanmar -- also known as Burma -- to protect Suu Kyi because he dreamed a terrorist group would assassinate her. The court is expected to convene at 10 a.m. Friday (11:30 p.m. ET Thursday). All defendants will be present at the court with their lawyers as the judges read the verdicts -- first for Suu Kyi, then for the other three on trial. A group of diplomats from European Union countries and Australia will be allowed to attend court on Friday, Win said. He described Suu Kyi as mentally strong. Asked where she would be imprisoned if convicted, he said it would be up to the government. Suu Kyi's two housekeepers, who are charged with cooperating to break the conditions of her house arrest, face a maximum sentence of five years in prison. Yettaw is also charged with violating Suu Kyi's house arrest and faces the same penalty as the housekeepers. But he is also charged with violating immigration laws and trespassing. The former carries a maximum sentence of three years in prison; the latter charge is considered minor but the sentence was unclear. Yettaw could serve a maximum of five to eight years in prison depending on whether the judge orders him to serve his sentences concurrently or one after the other. A lawyer selected by the U.S. Embassy is representing him. Suu Kyi, the iconic face of democracy in Myanmar, was placed under house arrest in 1989. The next year, the National League for Democracy won more than 80 percent of the legislative seats in the first free elections in the country in nearly 30 years. But Myanmar's military junta disqualified Suu Kyi from serving because of her house arrest and annulled the election results. Her supporters say Suu Kyi's latest arrest is meant to keep her confined so she cannot participate in the general elections that the junta has scheduled for next year. CNN's Kocha Olarn contributed to this report.